Muck is the most southerly of the group of islands known as the "Small Isles". It is also the smallest and flattest of the group measuring only 2 miles long by 1 mile wide. Up until 1892 Muck was part of Argyllshire but after 1892 it became part of Invernesshire. Muck has been inhabited since at least the Bronze age as indicated by the presence of many typical Bronze age burial cairns. 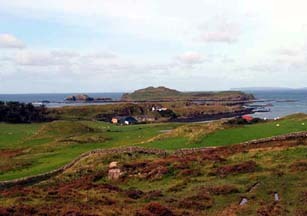 The first accounts of Muck go back until the 16th century. One of the most infamous incidents in the islands history occured in 1588 when a Spanish galleon was wrecked in Tobermory bay. Sir Lachlan MacLean of Mull employed the surviving Spanish sailors as mercenaries and let them loose on several islands belonging to the MacDonalds. One of these islands was Muck and as a result it was left plundered and in a desolate state. Gradually the island recovered and by the 18th century Muck was once again reasonably prosperous thanks to a considerate laird and the production of Kelp (which was used to make Potash). However, things turned sour once again as a collapse in the Kelp market saw 150 islanders leave for Novia Scotia. In 1854 Muck was purchased by Captain Thomas Swinburn who started a fishing industry but also rented the land for sheep farming. This led to further depopulation and only today is the island recovering thanks to the work of the current laird, Lawrence MacEwan. The island once had a population of nearly 300 but now there are around 30 souls on Muck. The laird advertises at intervals for young families to settle on the island as it's essential to maintain a viable primary school. 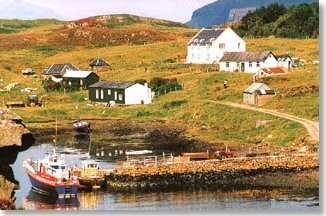 Isle Of Muck History - Excellent site packed full of the history of the island as well as plenty of local information. Good selection of photo's as well which probably make this site as close to an official Isle Of Muck site as you'll get. Calmac Ferries - Calmac site giving timetables & fares of sailings to the Muck and the other small isles.